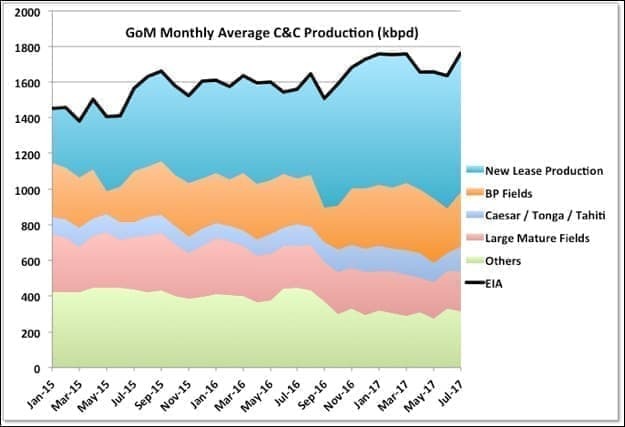 GoM C&C production for July by BOEM was 1746 kbpd and by EIA 1761, compared with, respectively, 1631 and 1634 kbpd (corrected) in June. The EIA number is a new peak, the BOEM one is still 24 kbpd short of their March numbers. The growth was from Thunder Horse (partially), Constitution and Baldpate/Salsa (which is mostly gas) coming back on-line, plus continued ramp-up in Stones and Marmalard. For new fields added since late 2014, data for Tubular Bell’s, which has not been available since late 2016, has been updated and shows a growth of about 14 kbpd in that period, hence there is now a slight continuing rise shown in new lease production over the past six months, rather than the previous plateau; Tubular Bells looks like it is now on plateau, about 40 percent below its nameplate, and there is no current drilling. Dalmatian North (online in March 2014) and Dalmatian South (online in December 2015) are small oil fields, which are not performing very well and might well go off line soon. At the moment it looks like their production is cycled every three or four months. Subsea pumping is due to be installed for them in late 2018. Heidelberg and Marmalard look to be about at their expected rate (Heidelberg is only about 50 percent of facility nameplate but I think more would have to come from additional tie-backs and I don’t see any drilling for that at the moment). Julia is the one reasonably sized recent addition that is still below nameplate and has current drilling, so could add another 15 kbpd, but with rapid decline in the first year based on the first well (it has subsea pumping installed but I don’t know how much that improves things). 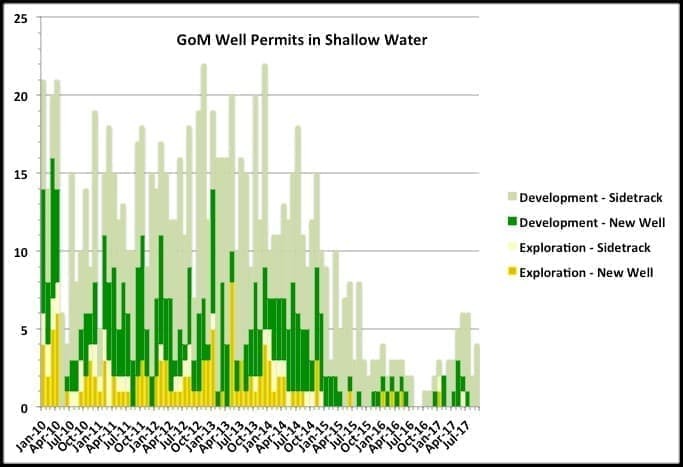 Stones is just about at expected capacity after what looks like quite a difficult start-up over about twelve months, but sometimes facilities can achieve higher rates early on, though I don’t know how long the approval process takes in the GoM to go higher. The water cut on the new fields looks like it’s starting to creep up, a possible sign that the production is plateauing. Of all the new leases started since 2015 only one in Tubular Bells and three in Great White have pressure support from water injection wells (though Jack has provision to add it later). 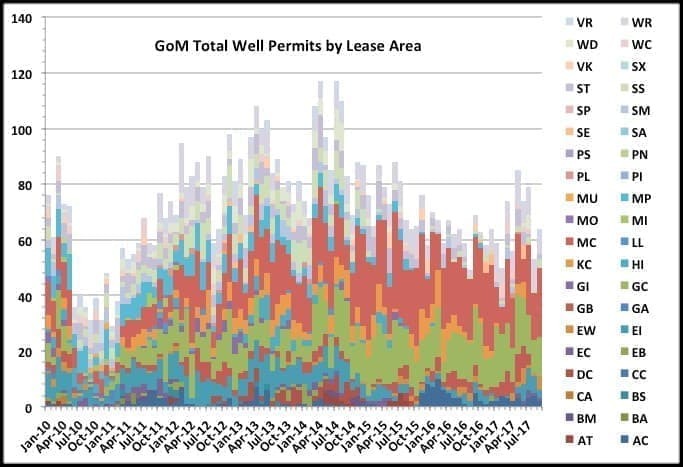 I think the other leases mostly rely on pressure depletion, with some partial aquifer drive or compaction drive support, which means that unless they are limited by surface facilities and have to be choked backed, and I don’t think many are as the facilities are generally operating below nameplate capacity, they will continuously decline unless new production wells are added. There are some older leases within the fields shown also with water injection, for Holstein, Mars-Ursa and King, but overall most of the production shown is likely now to start to show increasing decline rates as development drilling winds down, and as is already evident in a lot of the smaller fields. Thunder Horse was back online for most of July following a prolonged turnaround. There is still drilling there so there may be some more production to come from South Thunder Horse. Atlantis also has a lot of activity, possibly for North Atlantis start-up next year. The Constitution Spar also came back on-line after a long turn around. 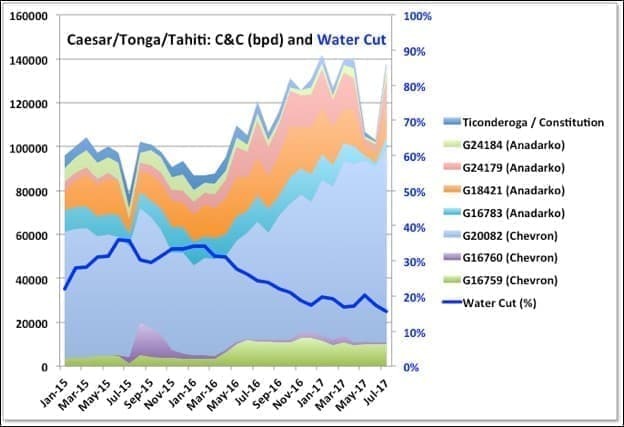 I’m not sure if there is any more to some in the Chevron leases produced through Tahiti, but there has been significant growth there over the past year (it was started in 2009 and a more typical production facility would be coming of plateau about now). The deep mature fields continue a general decline at 15 to 20 percent y-o-y. The water cut has declined a bit, possibly as some of the older wells water out and are shut in. The shallow wells show steady decline, note however that there is missing data for July, and probably a bit in June. Thunder Horse was shut down and fully evacuated following a power failure mid-September. That is a pretty major upset and shouldn’t happen (it would, in theory, require at least two independent failures), and would take a few days to find and correct the problem and get permission to restart. I wouldn’t be surprised if it was related to previous evacuations for hurricanes. Thunder Horse produces about 180 kbpd. 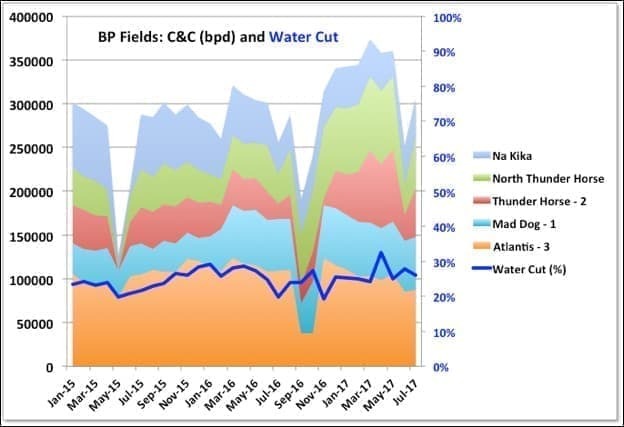 The estimates for hurricane related lost production were 84 kbpd (average over the month) for August and 60 kbpd for September – the Thunder Horse electrical outage might add another 20 kbpd to that. There may be some natural decline to add as well. On the other hand, Thunder Horse was not at full capacity in the July figures, so could add another 40 kbpd when it finally gets there. 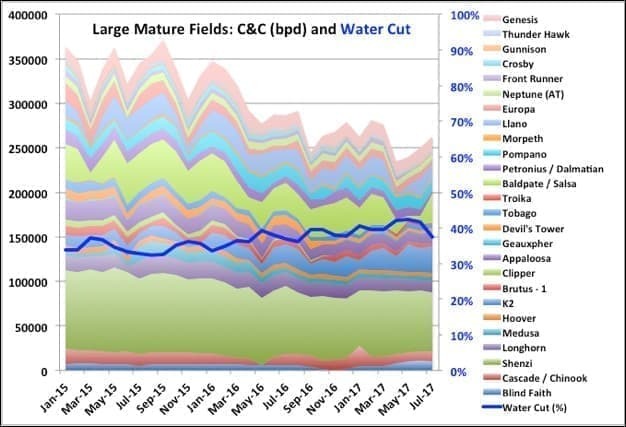 For natural decline rates the mature deep-water fields are dropping just under 80 kbpd per year and shallow fields about 40 kbpd per year, so maybe 10 kbpd per month overall. 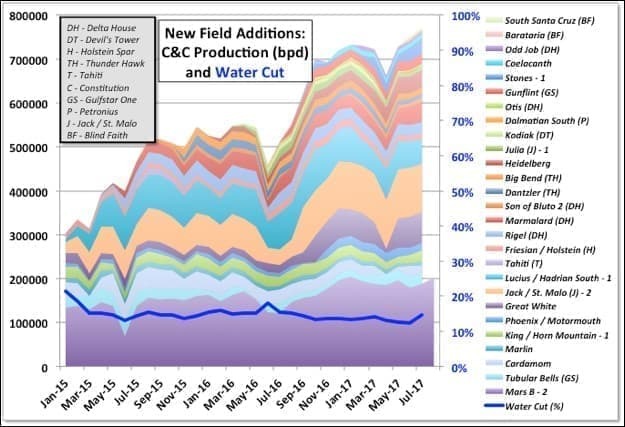 The new fields and the BP and Tahiti related fields also have natural decline on many of their wells but it is being covered by ramp-up of new fields and in-fill development wells. However, both those sources are starting to ease off so the overall decline rate will start to climb, eventually to as high as 20 to 25 percent based on R/P numbers. Overall then, there is likely to be a slight decline seen in the next couple of reports for August and September, but not as dramatic as the hurricane news might have suggested. However, the impact from Nate in October, plus a bit from the shut-ins on Delta House following the subsea pipe failure and subsequent leak, will be more significant, around 300 kbpd on average, and with some knock-on impact into November and later because of the drilling rig outages and depending on how much of, and for how long Delta House production is lost. I will probably not put together another update until the November figures come out as it will be difficult to tell what is happening on individual fields given the various shutdown and restart disruptions, but it will be interesting to see what EIA do with their STEO predictions. 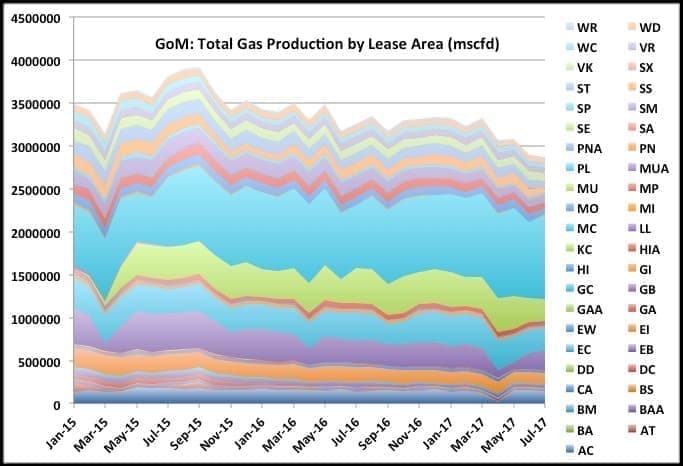 Most gas production is associated gas and is in slow decline from a local peak in 2015 (note this was about 80 percent lower than the main peak in the 90’s when there were still large gas fields in operation). 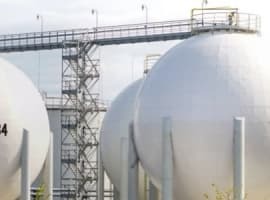 Most gas comes from the main deep water areas: GB – Garden Banks, GC – Green Canyon, MC – Mississippi Canyon, and KC – Keathley Canyon. 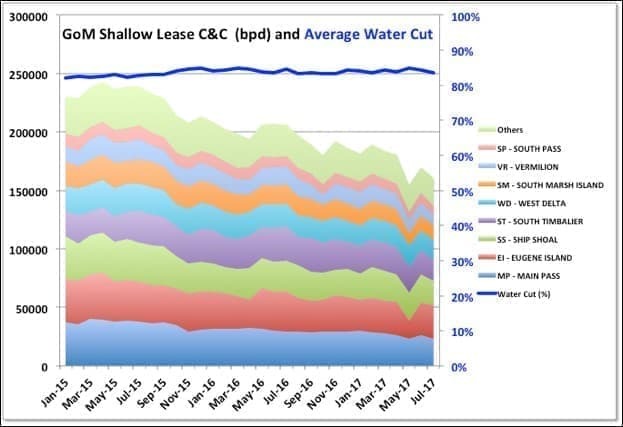 The thin lines on the top of the chart are mostly shallow lease areas and are in steep decline at over 20 percent y-o-y. As oil decline picks up so will the overall gas decline. 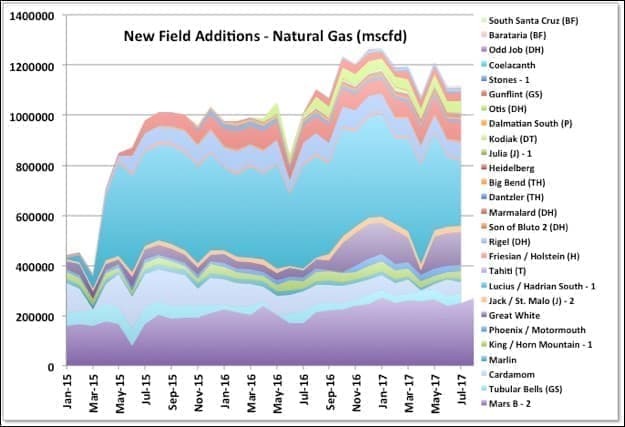 The new fields gas production is now showing clear signs of decline, mainly coming from Hadrian South (the only recent, largish natural gas field that’s come on line, but with R/P of only a couple of years based on remaining reserves from January 2016 at nameplate capacity, so bound to decline fast at some time). By the BSEE report for the last week of September there were 41 GoM well related activities in progress. Only two unnamed wells, indicating wildcats or appraisal, were being drilled: one, by BHP is Scimitar in GC 392 (which follows an announced oil show in Wilding-2 in a nearby block – Wilding-1 had a mechanical failure and had to be re-drilled); and one by Shell in WR 376. There are two P&A operations, eleven rigs running tools through wireline or coiled tubing, and twenty-nine active drilling rigs (including three predrilling for Stampede, Mad Dog II and Appomattox). Total and Chevron have entered into an agreement to drill eight near field exploration wells around the Anchor and Appomatox discoveries. The first was spudded in July on the Ballymore prospect (MC 607), which is listed against the East Anstey field, so may not count as a true wildcat. There were no new discoveries, start-ups or lease qualifications in September. One producing lease expired: Dalmatian, a small gas field started in March 2014; it had produced 30bcf and 0.15 mmbbls. There has been one definite FID decision in September for Buckskin. That will be tied in to Lucius, which would suggest there are no expectations that the lease there that was killed off in a couple of years with high water cut will be recovering. Buckskin will use two 8” flowlines. I haven’t seen expected production but I’d guess around 20 kbpd, due in late 2019 for LLOG (after Chevron, Maersk and Repsol have all pulled out as operator). At one time a large, stand-alone development combined with Moccasin (now dropped as an active lease) was expected. It is deep-water, high pressure but uses riser base gas lift, which suggests a tight reservoir, and probably fast decline with depletion drive. LLOG also announced tie-backs on a number of other small developments that are due in mid to late 2018 (I don’t know if these are formal FIDs yet, LLOG is a private company so doesn’t follow quite the same requirements as publicly listed ones, but these projects do have other partners who would need to agree): Clairborne, two wells tied to Coelacanth; Red Zinger, one well tied back to Delta House; Crown and Anchor, two wells tied back to Marlin; and La Femme / Blue Wing Olive (apparently a type of fly used in fishing), three wells tied back to Delta House. These will all be fairly small flows, I’d guess totaling around 45 to 60 kbpd nameplate and likely quite fast declining. All the wells to be tied back have already been drilled as exploration or appraisal. In terms of net additional production there is little or no spare capacity on Delta House (before the leak it was at an average of 90 kbpd and rising on a nameplate of 100, and it is designed with minimum on-line sparing so availability would be low), so the additions there imply the existing production is expected to be declining: the sister platform, Who Dat, showed quite fast decline after three years, which is about how old the Delta House fields will be mid-2018. There is quite fast decline on a couple of the fields on Marlin already, but there is existing spare capacity. Coelacanth is only at 11 kbpd on a nameplate of 30 so there’s plenty of capacity but I think Claiborne is small even by recent standards. 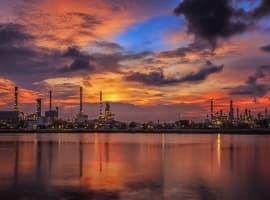 On the other hand, Anadarko, who had continued to be fairly active in exploration and development offshore, have signaled that they are going to use their cash flow for share buyback rather than seeking more growth (the Freeport MacMoran purchase last year may not be turning out to be such a great idea). With Anadarko cutting back LLOG is the most active player for developments at the moment though the recent pipe failure and shut down at the LLOG operated Delta House may delay things. In terms of net additional production there is little or no spare capacity on Delta House, so the additions there imply the existing production is expected to be declining (the LLOG sister platform, Who Dat, showed quite fast decline after three years, which is about how old the Delta House fields will be mid-2018. There is quite fast decline on a couple of the fields on Marlin already, but there is existing spare capacity. Coelacanth is only at 11 kbpd on a nameplate of 30 so there’s plenty of capacity but I think Claiborne is small even by recent standards. 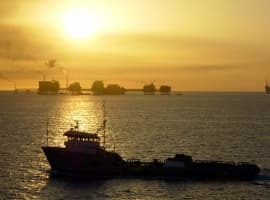 With these announcements there are now only five named discovered fields in the GoM that are not being produced or have fairly firm production plans, if not quite at FID yet – two small ones discovered this year, the other three also fairly small. There are a few other likely discoveries that have not been fully appraised and some undeveloped leases attached to existing fields. Shenzi (shown as the largest producer of the mature fields in the chart above) is operated by BHP. Some activist investors there are trying to get the company to pull out of oil and gas completely. Shenzi is not a typical asset to sell, as it’s a fairly major producer in mid-life. BHP is the fifth largest producer in the Gulf. As an indicator of longer-term production trends well permit numbers come after lease auction bids. Exploration wells indicate possible discovery rates and later FIDs and development well numbers indicate expected production in the nearer term. BOEM has extensive and up to date permit records. The charts below show numbers from 2010, with the hiatus in drilling following the Deepwater Horizon accident clear in each. They all show oil, gas or injection well numbers as I couldn’t find anywhere that these are differentiated, however most will be related to oil fields. For the first two charts I’ve only included new wells and sidetracks – i.e. wells with newly identified targets – and excluded amendments and bypass wells. The exploration numbers include appraisal wells. 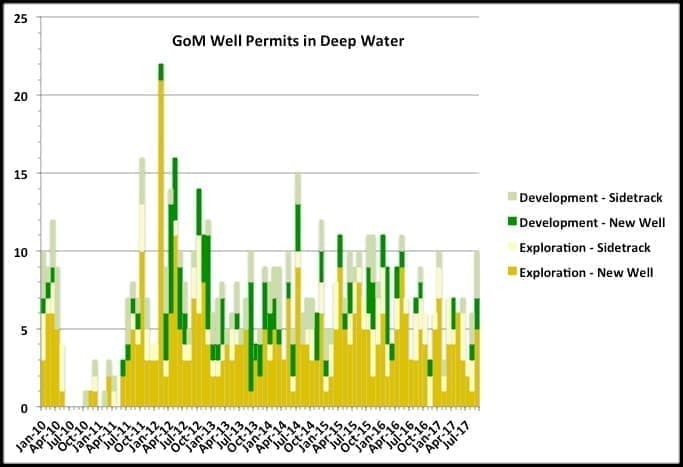 Shallow exploration has pretty much finished now, and development wells are also tailing off, with recent ones being sidetracks of older wells. Sidetracks mean well slots, and maybe wellheads, on exhausted wells can be reused for new targets without requiring new facilities (I’d guess there are now no free well slots on any of the older, shallow platforms). Deep water exploration and development numbers are also declining but relatively slowly. However, with recent low lease sales, a big drop in new projects coming on line and some of these development wells being predrilled for the few coming projects there could be a sudden drop next year (pace other influences, e.g. a sudden price rise might prompt more in-fill and exploration drilling). For all permits, including amendments, numbers are steadier but still dropping slowly. Most of the action is in the four-main deep water lease areas: MC, GC, GB and KC (see names above).